To love the world, or to love the Father, that is the real question. I know the answer if it were put to me. I hands down choose to love the Father. Loving the things of the world – such as lying, stealing, hating others (hate is akin to murder), lusting, and so forth and so on – leads to not just selfishness but also to being devoid of life. If anyone is devoid of life they are dead. Friends, I talk a lot about how Jesus Christ fulfills scripture, and how if and when we sever our ties with sin and its effects, death, that we have access to eternal life. I have but one question today: what is it you choose to serve? By serving the things of this world means you most likely will die with it. I don’t like being a guy who preaches hellfire, but if it gets your attention and puts you on the edge of your seat I’ll continue to do so. But today I wanted to try something different. By loving the Father, and choosing those things that are right, we stand with Him, serving Him for all eternity. I won’t go into what this means at this time as that requires a lot more study. But the point is by loving the things of this world, by allowing ourselves to be turned by the lust of the flesh – such as eating a piece of fruit that’s not ours, the lust of the eyes – allowing what you see to be seen as pleasing, and the pride of life – thinking these things fulfill – we determine exactly whose mold we’re made in. Are we made in God’s image? Yes. But we can also be made in the image of the world, by doing those things which aren’t of the Father, which I have already listed (lying, cheating, stealing, etc.). And by continuously doing those things we show ourselves where we believe we belong. 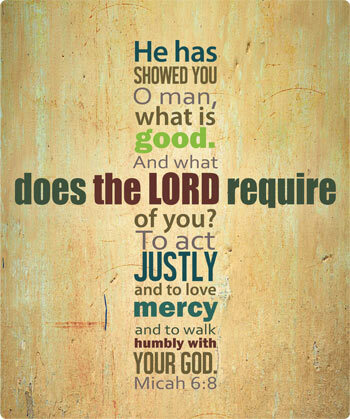 One of the biggest things we're told in scripture is to "Live justly, love mercy and walk humbly" (Micah 6:8) with God. Loving God means we live the same way as He does, doing these things every day, all year round. Jesus Christ came to abolish sin and death’s hold on us so that we would be able to be with the One who wants a restoration of humanity to Himself. What I’m saying is I’d much rather do and be bound by what my faith says it believes in, the saving power of Christ’s conquest over the grave, sin and death. I want continual access to the Father, not this world. What about you? Hopefully this word has blessed you today and may His grace and love abound more to you. In Jesus Christ's name. Amen.